1 Heat oil in a heavy bottomed vessel, add mustard seeds, let them pop, add the cumin seeds and split gram dal and let them slightly red. Add hing, red chillis and curry leaves, and saute for a few secs. 2 Add the thotakura and stir fry for 3 mts. 3 Add the yogurt mix and combine well. Keep stirring over medium flame till it comes to a boil. Reduce flame and cook for another 3 mts till the gravy thickens. 4 Garnish with coriander leaves and serve with white rice. 1 Heat oil in a heavy bottomed vessel, add cloves, cinnamon and cardamom and saute for a few secs. Add onions and fry till transparent. Add ginger-green chilli-garlic paste and saute for 3 mts. Add curry leaves, red chilli pwd, turmeric pwd, coriander pwd, cumin pwd and combine. Add the quartered tomatoes and fry for 4-5 mts. 2 Add the ground paste and cook for 5 mts, stirring so that it does not stick to the vessel. 3 Add 2 cups of water and salt and bring to a boil. Cook with lid on simmer till the gravy thickens. Add thick coconut milk and combine. Turn off heat. Garnish with chopped coriander leaves. Turn off heat. 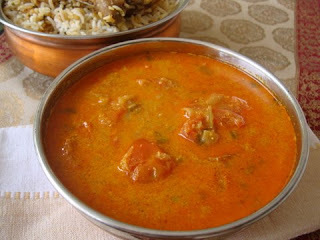 4 Serve with pulao, biryani, coconut rice or rotis. 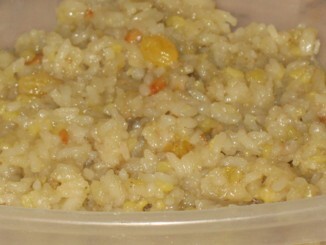 1.Cook rice and dal in a pressure cooker with 2½-3 cups of water. Keep ready before you proceed. 2.Fry the cashews and raisins in the ghee and set aside. 3.Heat half cup of water in a heavy-bottomed vessel large enough to hold the pongal. Crush the jaggery into pieces and add to the water to dissolve. 4.Once the jaggery is completely dissolved, turn off the heat and set aside to allow settling of any particles. After about 2-3 minutes, filter the solution to remove any foreign particles. 5.Rinse the vessel and pour the jaggery solution back to the vessel and place on heat to boil. 6.Once the jaggery solution boils, add the cooked rice/dal mixture to it. Mix well so that all the rice/dal is coated with jaggery. You may turn the heat off for a short while if you can’t manage mixing the pongal on heat. 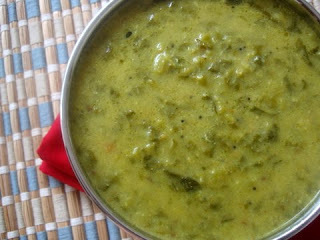 7.Turn the heat to low and stir well till the pongal thickens well. This will take about 5 minutes. 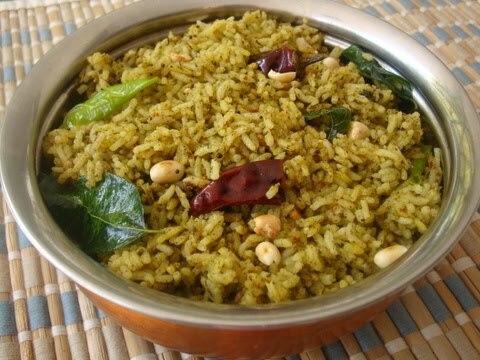 8.Now, add the cashews and raisins with the ghee to the pongal. Also, add the coconut and cardamom powder. Mix all these things well into the pongal. The color of the pongal depends on the color of the jaggery. This one was light colored. 1 Bring 2 cups of water to boil and add the rice flour and immediately cover it with a lid without stirring and reduce heat. Let it cook for 4-5 mts. Turn off heat and cool. Make small balls and keep aside. 2 In another vessel add the sugar and water and bring it boil. 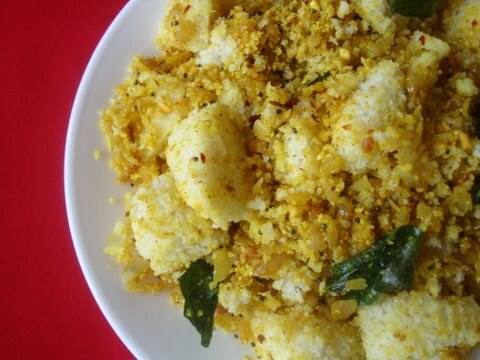 Reduce heat and add the grated coconut and stir for a few seconds. Add the rice flour balls and mix. 3 Add the milk and let the balls cook in this syrup for 3-4 mts. Now add the ground seasame seeds pwd and combine well. The consistency should be a slightly thick syrup. Turn off heat. Sprinkle ground elaichi pwd. 1 Combine both the flours with salt, ginger garlic paste, red chilli pwd, green chillis, curry leaves, sliced onions and cabbage. Add oil and mix well with fingers. 2 Add few tablespoons of water and mix well that it forms a slightly hard batter. Don’t add too much water. The batter should just coat the cabbage strips and onion slices. 3 Heat enough oil in a deep frying vessel. Once the oil turns hot, reduce flame to medium. Use your fingers to drop the batter in the oil to form small fritters. Deep fry till they turn golden brown. 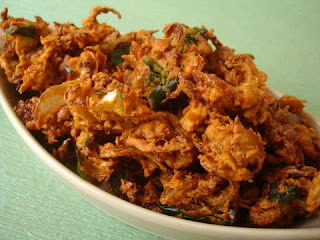 Use a ladle to keep turning the fritters so that it cooks on all sides. 4 Once they turn golden brown, remove them on to absorbent paper. Store in air tight containers and serve as evening snacks over a hot cup of masala chai (spiced tea). 1 Add a tbsp of oil in a cooking vessel, add the eggplant slices and roast them till brown on both sides. Remove and keep aside. 2 In the same vessel, add the remaining oil. Once hot, add mustard seeds and as they dance around, add the cumin seeds and allow to splutter. Add ginger garlic paste and saute for 2-3 mts. 3 Add salt to taste, red chilli pwd, turmeric pwd, coriander pwd, cumin pwd, roasted methi pwd and combine well. Add 1 3/4 cups of water and cook for 3-4 mts, till it comes to a boil. Add the roasted khus khus paste, tamarind extract and jaggery and cook on medium high flame for 3 mts. 4 Cover with lid and cook on medium low flame for 5 mts. Keep checking in between and stir fry to ensure it does not stick to the pan. 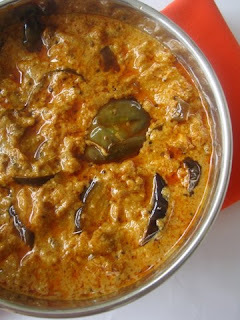 Add the roasted brinjal slices and cook on low to medium flame for 15 mts or till the gravy turns thick. Turn off heat. 5 Serve with rice or roti. 1 Sprinkle turmeric pwd, salt, a tbsp of oil and few fresh curry leaves to the cooked and cooled rice and keep aside. 2 Heat 1 tsp of oil in a pan, add the mustard seeds, methi seeds and dry red chillis and roast over slow flame till the methi turns red. Do not burn them nor under roast them. Remove from pan and cool. 3 In the same pan, add 3/4 tbsp of oil, add the red sorrel leaves and roast them on low flame till they wilt and lose their rawness. This should take about 7-8 mts. Remove from heat and cool. 4 Grind the roasted mustard seeds mixture to a coarse powder and then add the cooled red sorrel leaves and grind them together to a fine paste. Do not add water. Remove and keep aside. 5 Heat the remaining oil in a cooking vessel, add the mustard seeds and let them splutter. Add dry red chillis, cumin seeds, channa dal, urad dal and fry for a minute till light brown. Next add the slit green chillis, asafoetida and few curry leaves and fry for a few seconds. 6 Add this tempering along with red sorrel leaves to the cooled rice and combine well such that its spread all over the rice. Adjust salt. Finally sprinkle roasted peanuts and combine well. Let it sit for at least an hour for the flavors to set in. If you feel the rice needs more tart flavor, squeeze some lemon juice. 7 Serve with appadam/chips, majjiga mirapakaayalu (sun dried chillis) and yogurt. Makes for a complete meal. 1 Heat oil in a kadai, add mustard seeds and let them splutter. Add urad dal and let it turn red. Add curry leaves, asafoetida and turmeric pwd. 1. Clean the Ceramic/Glass Jar and allow it to sun dry before using it for making wine. 2. Boil water and allow it to cool completely. 3. Clean and wash the grapes well and remove the stalks. 4. Dissolve yeast in luke warm water and keep it aside for 10-15 minutes so that it rises. 5. Mash the grapes using a wooden spatula or crush the grapes with your hands. Add half the quantity of sugar (2 lbs) to the crushed grapes and mix well. 6. Transfer the crushed grapes and sugar mix to the ceramic/glass jar. Add yeast to the jar. 7. Add cinnamon and cloves. This will give the wine a very nice spicy aroma and flavor. 8. Add boiled and cooled water to the jar.Mix everything well. Keep the jar closed and airtight for 21 days. 10. After 21 days, strain the grape pulp mixture into another vessel using a muslin cloth or clean unbleached cotton cloth. Add the remaining 2 lb sugar and mix well. The Wine will be hazy at this stage. 11. Keep it for another 21 days so that the sediments settle down and the wine becomes clear. Strain the mixture again using a muslin cloth without disturbing the sediments. My wine had a light pink color because of the grapes I used. 12. Store the wine in clean dry glass bottles. While serving, pour it carefully without disturbing the sediments. The longer the wine is stored, the better the taste. 1. Take a saucepan and add 1/2 cup sugar. 2. Place it on medium heat and keep on stirring continuously till the sugar melts and becomes a dark brown color. Keep scraping down the sides of the pan so that the sugar gets caramelized evenly. 3. Remove from fire and place the pan in ice cool water so the sugar doesn’t get burnt. 4. Add 4-5 tbsps of hot water to this sugar syrup and mix well. 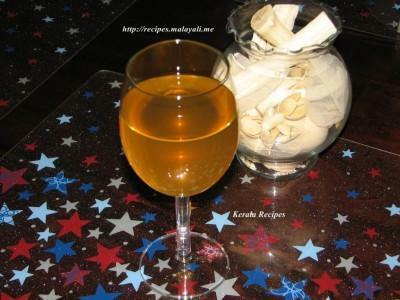 Cool and add the syrup to the wine and mix well. 5. The wine will attain a darker color now. * if you live in a moderately hot place like Kerala, wine will ferment quickly and it will be ready in around 21 days.